Tagged under Aruko, Madhouse, Series. A really nice RomCom anime that will make you feel really good. I can't help but keep on watching to know what will happen next to Takeo and Rinko's love story. The artwork looks really nice, not too fancy but looks really clean. The main characters are all likable (to me anyway :D ), mainly because of their actions, that you don't get to see every time in everyday life. The side characters are interesting as well because of their interactions to the main characters. Overall, I really like it. I can't help but get excited every time Takeo and Rinko are together! 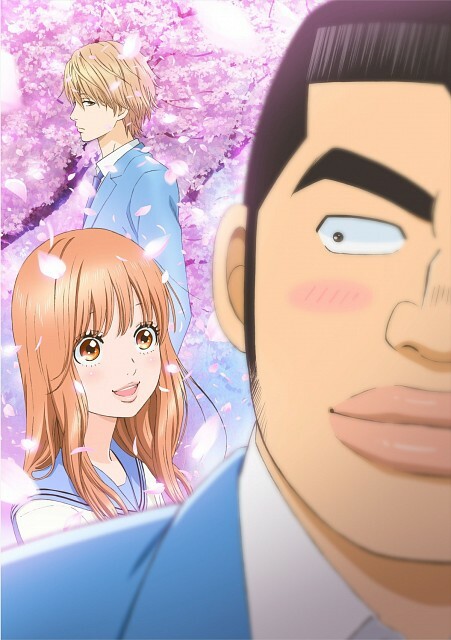 This Shoujo is different from our typical shoujo/romance stories, the man is not girls' all time favorite Alpha man, but Takeo even with ape like body is really nice and considerate, Yamato and Sunagawa as well are really likable characters. Story isn't Cliche or boring, it'll always make you laugh like crazy, mangaka also did Artworks really nice, colored illustrations are warm and each panel is beautifully done. Looking forward to more chapters! If you want to read romance but not that typical cliche then I highly recommend it! Really awesome ^^ Love the character designs; everything's really vibrant as far as the colors as well. Takeo & Yamato are just so cute as a couple. Takeo is simply awesome. Yamnato and Takeo are a great couple. And Suna is an awesome friend. I hope this gets a season two. No feedback on Ore Monogatari! !.